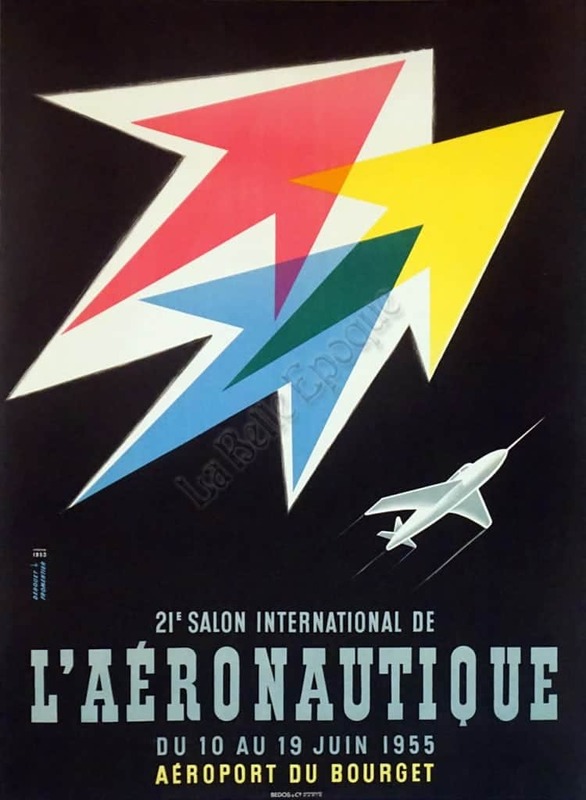 This is a Mid-Century Modern French poster for an air show at the Bourget Airport which took place from the tenth to the 19th of June 1955. This poster features a bold but simple design, and has all the hallmarks of the space-age influenced aesthetic that was so dominant at the time. The background of the poster is a deep shade of black, interrupted by three images: first, in the center of the poster, three translucent overlapping arrows, one hot pink, one blue, one green, shooting off to the right; below that, a small Futurist airplane depicted in a sleek silver, flying roughly in the same direction; and then below that, the name, date, and location of the event, centered, in a starkly efficient silver typography, with a dash of yellow at the very bottom. The poster was originally designed in 1953, but for the air show in 1955, it was changed to add the jet plane. The ecstatically futuristic design of the piece carries all the of the hallmarks of the optimistic faith in technology of its time, that was seen in aesthetics ranging from Industrial Design to Hollywood film titles. This is a bold and dynamic piece that sweeps up its viewer in its playful idealism. It was originally designed by the artists Paul Fromentier & Edgar Derouet, 1953.